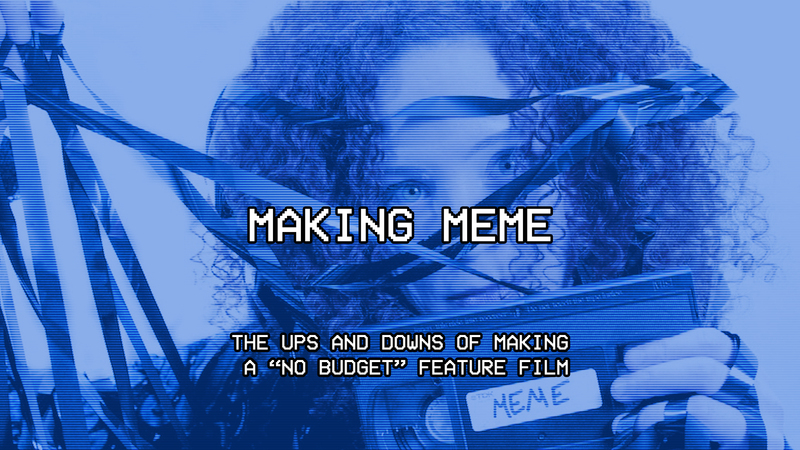 “Making Meme” is a series of blog posts about the long process of taking a project from an idea to a completed feature film. I made a lot of mistakes on the way and learned a lot of lessons, but I also had a lot of fun and got to work with a lot of wonderful people throughout the process. These posts are presented in the hopes of helping others in their struggles to make a film. Day Two immediately followed Day One. We shot the rest of the office scenes on Day Two, November 22nd 2014. Again we were at the conference room One Glass Video had access to. We only had two scenes to shoot but they were longer and more complicated scenes than the first day. The big scene of the day is when our lead character Jennifer finally stands up for herself against the absurd requests of her clients. It was an important one to get right in particular as it has some tonal shifts. Parts of that scene also go back to some of the earliest drafts of the film. At this point with the film we were still figuring out the workflow and getting a sense of the equipment and we had available to us. Again it was great to be starting off our shoot where our gear lived at the One Glass office as it removed one logistics issue from planning for the day and allowed us to settle in and even experiment a bit more. A film evolves through the stages of production. As we’ve already shown some through the posts in this series on pre-production there’s changes in circumstance or plans that affect the film. During production you also make choices and make plans that may or may not be followed through in post-production. There are lessons learned through the process. Firstly, there’s a special type of shot that appears at multiple points through the film. This is something we planned just ahead of production. It was Director of Photography Peter Westervelt’s suggestion, because the film flirts with the theme of being watched. We have multiple shots on through the film shot on a Tilt Shift lens. The first example of this we shot on Day One. We shot another example of this, which we didn’t end up using on Day Two. In the end the reason we used the shot on Day One instead of Day Two is that in the process of using the shot for a few scenes throughout the film during production, we took in what this shot meant for those scenes and the idea of our lead character essentially “being watched” in those scenes. The Tilt Shift lens really narrows the focus in the shot to just a sliver of the image. It subtly makes Jennifer looks smaller. The Tilt Shift shot we got on Day One isolates her, enhances the feeling of her being along. The shot on Day Two was in a scene where she was victorious. The first worked better. During production we felt like this was a very important shot that was going to really sell Jennifer’s emotional arc. In post-production, I think we found the effect of it was a bit more subtle. Still there. Still, I think, effective, but not quite as core a part of the style of the film as we had planned. They are some of my favorite shots in the film still. Secondly, the original drafts of the film were written with a non-linear approach. The story jumped around a bit in time. That was an idea baked in from the beginning. As we got closer to shooting the film I reorganized the script so it was linear. It made it easier for us to break down for production. The problem with that, for me anyway, is then it wasn’t long before that’s how I started to think about the film. I considered what we were shooting almost exclusively linearly the further we got into shooting the film. This would become important much later in the process. The second day of shooting went well. The scene where Jennifer stands up for herself will always be one of my favorites. I love how everyone handles the scenes. Phillip Andry came in to play the boss of Jennifer’s Clients, played by June Dare and Alex Bone, and really settled very well into the rhythm of the scene with them. Day Three of shooting wouldn’t happen for more than a month. We attempted to put it together just a few weeks later with a scene taking place at a character’s apartment, which we planned to shoot at Kitty Ostapowicz’s apartment, she served as an Assistant Producer on the film and plays the character Carrie. That didn’t come together because scheduling in December is a bit tough as the holidays had an impact on a few people’s schedules and I hadn’t cast one of the characters we needed for that scene, Kyle, yet. So, we were delayed. The delay was good as it gave us time to bring some new people on board who would be vital to the project. In my next post, I’ll discuss the gap between Days Two and Three.